Can we all just agree that if you've clicked into a story about Game Of Thrones, then you've made your peace with the fact that it will have some degree of spoilers in it? Yeah, great. Now that we've reached an understanding, how about that scene with Jon hoping on the back of a dragon on going on a romantic trip with Dany? They were just short of breaking out into a verse of 'A Whole New World'! 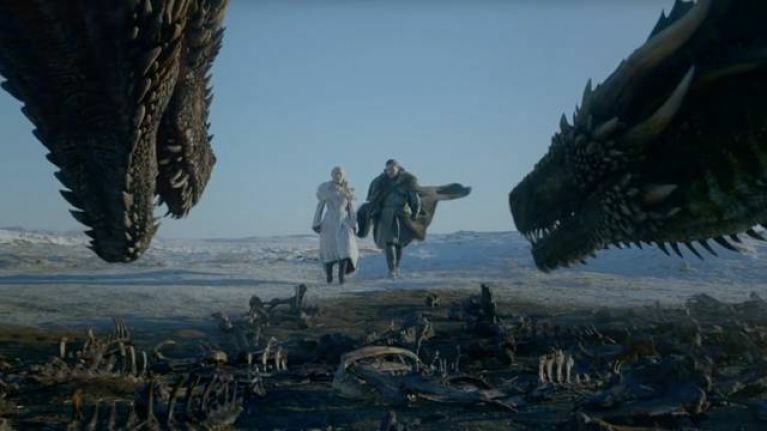 As our Game Of Thrones Maester Paul Moore said in his review of 'Winterfell': "Jon finally embracing his Targaryen lineage is what this episode was really about and it's impossible not to get a kick out of the moment when he finally got to fly on the back of Rhaegal." It was a great little scene, obviously there to set up a small bit of peace and quiet before the all-out war kicks in before too long, and viewers at home all reacted fantastically to it, too. If you missed the 2am debut of the latest episode on Sky Atlantic, then it is on again at 9pm tonight (Monday 15 April), and is also available to watch right now on NOW TV.